Below is a list of Interest Groups that are currently available. Follow the above links to go to the group's webpage. To see summary information for all groups go to the Interest Group Summary which is further down this webpage. New Joiners are given a paper copy of our Information Booklet which contains Interest Group information. Follow the link to view or download. Corrections to the May paper and website versions were added in June 2018. In February 2019 a paper booklet Review 2018 was issued to members, this has information and photographs provided by the group leaders about their group activities during the past year. Colouring Please contact Margaret Warren (01509880451). 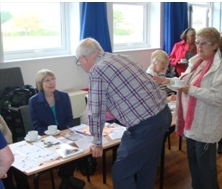 If a Keyworth & District U3A interest group is well below optimum numbers, or struggling to remain viable, members of neighbouring U3As are permitted to join the group without having to join Keyworth & District U3A. Such groups are referred to as minority interest groups. If group leaders wish to involve members of neighbouring U3As in their group they should ask the Groups Co-ordinator for existing groups to consider their group a minority interest group. At present (September 2017) Keyworth & District U3A have 3 minority groups to which neighbouring U3A members are invited to attend: Philosophy and the World War 1 History group. These are marked with an 'M' in the Interest Group Summary below. The Keyworth & District U3A arrangements for minority interest groups are set out in our Support for Minority Interest Groups document. Follow the link to go to the group's webpage. Groups with M after their name are Minority Interest Groups (see above).